WHAT KIND OF INFORMATION DOES WE COLLECT? Virtus Tactical collects the personal information you provide us in connection with your purchase transaction, such as your name and telephone number. We also collect and maintain records and history about customers’ purchases and product preferences. If you pay by credit card, debit card or check, you provide us with your account information. If you return merchandise or request a refund or exchange, you provide us with your personal information. Also, when you register or create an online account with us, sign up for e-mail, contact customer service, participate in our surveys, or promotions, or send us feedback or submissions, you are providing us with your personal information. HOW DOES VIRTUS TACTICAL USE MY INFORMATION? HOW DOES VIRTUS TACTICAL USE "COOKIES"? We and some of our third-party service providers use “cookies”. A “cookie” is a small text file written by an Internet server to a Website user's browser where information is exchanged between them, and which is stored on a computer's hard drive to allow us to recognize and track users on our Website to assist us in providing our customers with a productive online experience. Cookies enable us to store information about your use of our Website, such as the areas you visit and the length of your stay. Most browsers are initially set up to accept cookies and can be reset by using the 'Help' portion of the toolbar to refuse all cookies or indicate when a cookie is being sent. Should you choose to disable any cookies associated with the Website, you will not be able to take full advantage of all the Website's features, but you should be able to navigate the Website without difficulty. DOES VIRTUS TACTICAL SHARE MY INFORMATION WITH THIRD PARTIES? 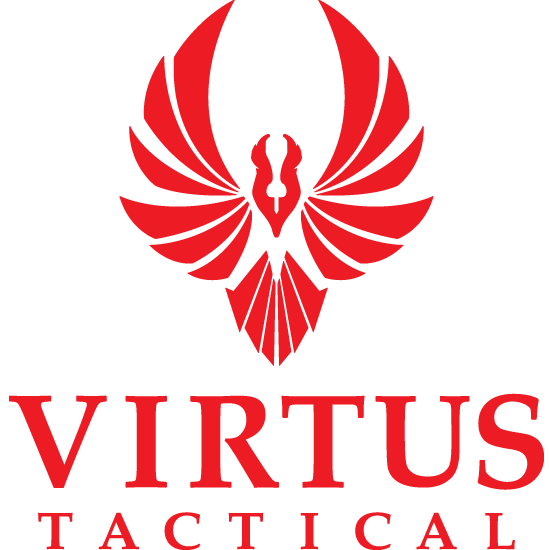 IS MY INFORMATION SECURE WITH VIRTUS TACTICAL? HOW DO I OPT-OUT FROM VIRTUS EMAIL? * You may opt-out of receiving promotional email from us by doing one of the following: * If you originally signed up for Virtus Tactical email, please return to the email sign-up page, and complete the 'unsubscribe' entry field and click the “Unsubscribe” button. Please be sure to use the same email address as that which you used to sign-up. Otherwise it may not be possible to comply with your request. * If you have received an email from Virtus Tactical, you can follow the opt-out or 'unsubscribe' instructions provided in your e-mail. HOW DOES VIRTUS TACTICAL PROTECT KIDS' PRIVACY? We are concerned about the safety of children when they use the Internet and will never knowingly request personally identifiable information from anyone under the age of 18. Users of the Website must be at least eighteen years old. If a child has provided us with personal information, that child’s parent or guardian should contact us at admin@virtustac.com to delete such information from our records.